Positron emission tomography (PET) scanning is one of the most frequently used molecular imaging procedures. Molecular imaging is a type of medical imaging that provides detailed pictures of what is happening inside the body at the molecular and cellular level. Where other diagnostic imaging procedures—such as x-rays, computed tomography (CT), and ultrasound—predominantly offer anatomical pictures, molecular imaging allows physicians to see how the body is functioning and to measure its chemical and biological processes. Molecular imaging procedures, including PET and PET-CT scanning, are noninvasive, safe and painless. How does molecular imaging work? When disease occurs, the biochemical activity of cells begins to change. For example, cancer cells multiply at a much faster rate and are more active than normal cells. Brain cells affected by dementia consume less energy than normal brain cells. Heart cells deprived of adequate blood flow begin to die. As disease progresses, this abnormal cellular activity begins to affect body tissue and structures, causing anatomical changes that may be seen on CT or MRI scans. For example, cancer cells may form a mass or tumor. With the loss of brain cells, overall brain volume may decrease or affected parts of the brain may appear different in density than the normal areas. Similarly, the heart muscle cells that are affected stop contracting and the overall heart function deteriorates. Molecular imaging excels at detecting the cellular changes that occur early in the course of disease, often well before structural changes can be seen on CT and MR images. Most molecular imaging procedures involve an imaging device and an imaging agent, or probe. A variety of imaging agents are used to visualize cellular activity, such as the chemical processes involved in metabolism, oxygen use or blood flow. In nuclear medicine, which is a branch of molecular imaging, the imaging agent is a radiotracer, a compound that includes a radioactive atom, or isotope. Other molecular imaging modalities, such as optical imaging and molecular ultrasound, use a variety of different agents. Magnetic resonance (MR) spectroscopy is able to measure chemical levels in the body, without the use of an imaging agent. Once the imaging agent is introduced into the body, it accumulates in a target organ or attaches to specific cells. The imaging device detects the imaging agent and creates pictures that show how it is distributed in the body. This distribution pattern helps physicians discern how well organs and tissues are functioning. PET involves the use of an imaging device (PET scanner) and a radiotracer that is injected into the patient’s bloodstream. A frequently used PET radiotracer is 18F-fluorodeoxyglucose (FDG), a compound derived from a simple sugar and a small amount of radioactive fluorine. Once the FDG radiotracer accumulates in the body’s tissues and organs, its natural decay includes emission of tiny particles called positrons that react with electrons in the body. This reaction, known as annihilation, produces energy in the form of a pair of photons. The PET scanner, which is able to detect these photons, creates three-dimensional images that show how the FDG is distributed in the area of the body being studied. Areas where a large amount of FDG accumulates, called ‘hot spots’ because they appear more intense than surrounding tissue, indicate that a high level of chemical activity or metabolism is occurring there. Areas of low metabolic activity appear less intense and are sometimes referred to as ‘cold spots.’ Using these images and the information they provide, physicians are able to evaluate how well organs and tissues are working and to detect abnormalities. PET-CT is a combination of PET and computed tomography (CT) that produces highly detailed views of the body. The combination of two imaging techniques—called co-registration, fusion imaging or hybrid imaging—allows information from two different types of scans to be viewed in a single set of images. CT imaging uses advanced x-ray equipment and in some cases a contrast-enhancing material to produce three dimensional images. A combined PET-CT study is able to provide detail on both the anatomy and function of organs and tissues. This is accomplished by superimposing the precise location of abnormal metabolic activity (from PET) against the detailed anatomic image (from CT). 59 y-o female patient with non-small cell lung cancer shown above. 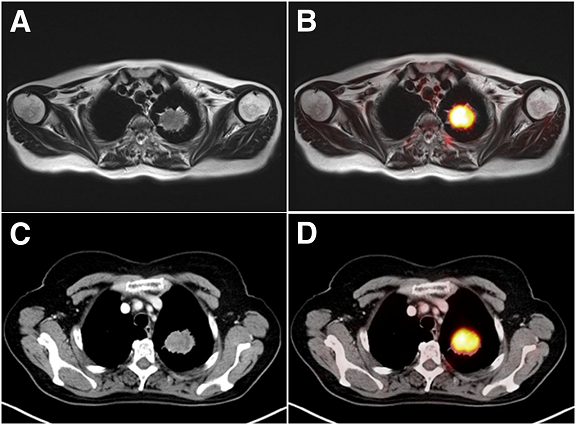 (A) T2-MR scan (B) Fused 18F-FDG PET/MR scan (C) CT scan (D) 18F-FDG PET/CT scan. Tumor was correctly staged as T2a tumor. The procedure begins with an intravenous (IV) injection of a radiotracer, such as FDG, which usually takes between 30 and 60 minutes to distribute throughout the body. The patient is then placed in the PET scanner where special detectors are used to create a three dimensional image of the FDG distribution. Scans are reviewed and interpreted by a qualified imaging professional such as a nuclear medicine physician or radiologist who shares the results with the patient’s physician. What are the advantages of PET? PET is a powerful tool for diagnosing and determining the stage of many types of cancer, including lung, head and neck, colorectal, esophageal, lymphoma, melanoma, breast, thyroid, cervical, pancreatic and brain cancers. The value of PET for many other cancers is currently being investigated through the National Oncologic PET Registry. By detecting whether lesions are benign or malignant, PET scans may eliminate the need for surgical biopsy or identify the optimal biopsy location. PET scans are currently the most effective means of detecting a recurrence of cancer. PET is frequently used to identify areas of the brain causing epileptic seizures as part of an evaluation of surgery as a treatment option. Information provided by PET scans helps physicians and patients evaluate treatment options, such as angioplasty or coronary artery bypass surgery. Is PET covered by insurance? Medicare and private insurance companies cover the cost of most PET scans. Check with your insurance company for specific information on your plan. What is the future of PET?